I went sculling yesterday, probably the first time in a single for about 2 years. I’ve spent a lot of time coxing crew boats and in the bigger boats rowing, but never really cracked the single sculling thing (falling in and getting wet not really being my favourite thing – I like scuba diving but hate swimming!). However, instead of walking the few 100 yards and using a scull from one of the Tideway clubs I live close to, I decided to try some safer water and go and use a boat out at Dorney (one of the Army sculls). The river there is a lot smaller and you can even see the bottom! A far easier place to get back in a boat. I managed to get in and out, always the tricky bits, and managed an hour’s outing before calling time with achy bits. A good load of exercise when combined with the walk to and from the station. On the walk, this really annoyed me. 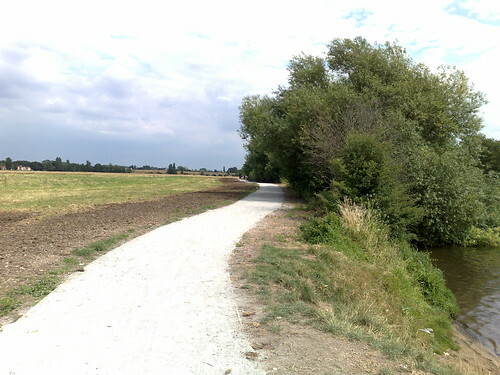 The river path has been ‘upgraded’, flattened out and covered with grey stone/dust. I’m sure it’s all about providing access but what they have done is stripped all the charm away, cutting back and killing all the path side plants that can make a walk interesting. Now it’s just like a pavement, just next to a river. It; only covers part of the way so you soon get back to the more overgrown parts, which are a lot more fun.